To Cite: Kumar S, Tiwari T, Singh N, Singh S, Dahiya S, et al. Comparative Study of Isobaric Levobupivacaine and Hyperbaric Bupivacaine for Lower Segment Caesarean Section Under Spinal Anaesthesia in Northen India, Ann Anesth Crit Care . 2018 ; 3(1):e66749. doi: 10.5812/aacc.66749. Background and Objectives: Central neuraxial blocks are the preferred technique for anesthesia for lower segment caesarean section. Local anesthesia drugs have been routinely used for spinal anesthesia to compare various block characteristics and hemodynamic changes in patients undergoing lower segment caesarean section using hyperbaric bupivacaine and isobaric levo-bupivacaine. Methods: After Institutional ethical committee approval, 100 patients scheduled for elective lower segment caesarean section were randomized into Group L and Group B. Group L (N = 50) received 2.5 mL (12.5 mg) 0.5% isobaric levo-bupivacaine and Group B (N = 50) received 2.5 mL (12.5 mg) 0.5% hyperbaric bupivacaine as intra-thecal drugs for spinal anesthesia. The present study was conducted in Operation theaters and the Post-operative ward of LLRM medical college, Meerut. Difference in characteristics of onset of block, regression of block, hemodynamic profile, and side effects were recorded between groups. Results: Group L, in comparison to Group B, showed prolonged duration of sensory block (P = 0.01) with lesser duration of motor block (P = 0.0002). Hemodynamically hypotension was statistically significant in the bupivacaine group (P = 0.016). Conclusions: The current study validates that both isobaric levo-bupivacaine and hyperbaric bupivacaine in spinal anesthesia provide effective surgical anesthesia for lower segment caesarean section. Levo-bupivacaine can be a better alternative to bupivacaine in terms of reduced motor block time and a longer sensory block time with lesser incidence of hypotension and better hemodynamic stability. Neuraxial anesthesia is one of the most common anesthesia techniques used for lower segment cesarean section performed these days. Reducing the risk of airway manipulation and negating the placental transfer of general anesthesia drugs to the fetus, neuraxial anesthesia continues to be the preferred choice of anesthesia. Of all available techniques of neuraxial block, spinal anesthesia is the most simple to perform with early onset and predictable block height. The effect of the block depends on the volume, concentration, and dose of the drug used (1, 2). The ratio of the density of local anesthetics (LAs) and cerebrospinal fluid (CSF), which is known as LA baricity, is one key determinant of LA distribution within the subarachnoid space (3). Bradycardia and hypotension may occur following mobilization when hyperbaric solutions are used and isobaric solutions are favored due to less sensitivity to position change properties (4). Levo-bupivacaine use in clinical practice is due to its reduced toxic effects on the heart and central nervous system (5), as compared to bupivacaine. Studies comparing levo-bupivacaine and bupivacaine have been done in lower abdominal surgeries (6), however, there are few studies in pregnant patients for caesarean section. Therefore we did a randomized, double blinded, comparative prospective study to compare isobaric Levobupivacaine and hyperbaric Bupivacaine for surgical anaesthesia and post-operative analgesia in patients undergoing elective lower segment caesarean section. After approval from the Institutional Ethical Committee, the present study was done in operation theaters and the post-operative ward of Lala Lajpat Rai Memorial Medical College, Meerut, India. A total of 100 women in the age group of 18 years to 35 years scheduled for elective lower segment cesarean section, of more than 35 weeks gestation, American Society of Anesthesiologists physical status class I or II, were enrolled in the study. Patient refusal for regional anesthesia, history of uncontrolled diabetes, hypertension, coagulation abnormalities or any other severe systemic illness like severe respiratory, cardiovascular, and neurological disorders, history of low back surgery, any patient receiving tocolytics, hormonal preparations, and anti-hypertensive medications was excluded from the study. Any contraindication to spinal anesthesia was also considered as the exclusion criteria. Informed written consent was taken from patients and the procedure was explained thoroughly to all at the time of the pre-anesthesia checkup. All necessary routine investigations were done according to institutional protocol; body weight, height, and vitals were all recorded. No anxiolytics were advised. Based on a departmental pilot study, considering 95% confidence interval and 80% power of study sample size of 50 patients in each group was found to be appropriate. Group L - 0.5% Isobaric Levo-bupivacaine group of 50 patients. Group B - 0.5% Hyperbaric Bupivacaine group of 50 patients. On the surgical day, the patients were nursed into operation theaters in the left lateral position and the procedure was explained to the patient once again. Once comfortable with the surroundings, on the operation table, multipara monitor (Drager, Infinity Vista XL) was attached and reading of all vitals, including pulse-rate (HR), systolic blood pressure (SBP), diastolic blood pressure (DBP), mean arterial pressures (MAP), and peripheral oxygen saturation (SPO2) were recorded and marked as baseline values. A total of 20 G of intra-venous (I.V) cannulation on the dorsal aspect of non-dominant forearm was done observing all sterile precautions and preloading started with ringer lactate at 10 mL/kg body weight over 10 minutes. After preloading, the patient was made to sit on the OT table with an adequate footrest. The assistant was asked to maintain the patient in a position such that both the iliac crest are at same horizontal level and both the shoulders are at the same horizontal level. The intervertebral space was identified and under strict aseptic precautions, lumbar puncture was performed in the midline using 26 G quincke spinal needle at L2-L3 or L3-L4 space. A total of 2.5 mL of the drug was injected at 0.2 mL/seconds without barbotage, once free flow of CSF was obtained. Group L patients received Inj Levobupivacaine [Levo-anawin, Neon pharmaceuticals Ltd] 0.5% isobaric 2.5 cc (12.5 mg) intrathecally. Group B patients received Inj Bupivacaine [Anawin heavy, Neon pharmaceuticals Ltd] 0.5% hyperbaric 2.5 cc (12.5 mg) intrathecally. All the patients were comfortable with the above technique and no discomfort was noted from patients. The study medication was prepared and administered by an anesthesiologist not involved in the present study. Another anesthetist blind to the identity of study medication monitored and managed the patients as well as collected data. After successful completion of subarachnoid drug placement, patients were made supine. Prior to the start of the surgery, the anesthesiologist checked the sensory and motor block level. The level of sensory block was assessed using the pinprick test using a 25 G blunt needle in the mid clavicular line. The level of motor block was assessed using the modified Bromage scale (0 = no motor block, able to flex hips, knees and ankles; 1 = just able to flex knees, unable to extend legs; 2 = able to move ankles, unable to flex knees; 3 = unable to flex ankles, knees or hips, complete motor block). Oxygen at 4 L/min was administered using a face-mask. No premedication and sedatives were administered during the course of the surgery. The characteristics of block were noted at every 2 minutes intervals up to 10 minutes, at 15 minutes then every 15 minutes until 90 minutes. After 90 minutes, the above parameters were noted every 30 minutes up to 240 minutes. The time of intra-thecal drug placement was considered as 0, and then various block characteristics in terms of time to onset of sensory block until T6, the time to onset of motor block, the time taken to reach maximum sensory block level, the time taken to reach maximum motor block, the time to regression of two dermatomes of the sensory block, the duration of the regression of the sensory block level to T12 from the maximum level, and the duration of return of full motor power was recorded. Time to complete the motor block was recorded when modified Bromage score of 3 was attained. Complete motor block recovery was defined when modified Bromage score of 0 was achieved. The patient’s hemodynamic parameters were recorded at 2 minutes intervals up to 10 minutes and then at 5 minutes interval until 60 minutes then at 75 minutes, 90 minutes, and then every 30 minutes until complete regression of motor and sensory block features. The surgeon was asked to proceed once T4 or T6 level was achieved. The block was considered a failure if complete sensory and motor block was not achieved even after 15 minutes. Failed blocks were converted to GA and were excluded from study. Hypotension, defined as a systolic blood pressure less than 100 mmHg or a decrease of more than 25% from baseline, was treated with incremental doses of Injection Mephentermine 6 mg IV. Bradycardia, defined as a heart rate < 50 beats per minute, was treated with Injection atropine 0.5 mg IV. The statistical analysis was done using SPSS (Statistical Package for Social Sciences) Version 15.0 statistical Analysis Software. The Qualitative data are represented in Number (%) and mean ± SD. Quantitative data, presented as the proportion or number, were evaluated by χ2 test. P value of < 0.05 was accepted as statistically significant. Table 1 shows the anthropometric variables and hemoglobin values between Group L and Group B. Both the groups were similar in terms of anthropometric variables and were clinically and statistically insignificant (P > 0.05). bP > 0.05 = No significant difference. Table 2 shows the various block characteristics in terms of sensory and motor variables. A total of 62% of patients in the Levobupivacaine group reached highest dermatome above T4 level as compared to only 18% in bupivacaine group. 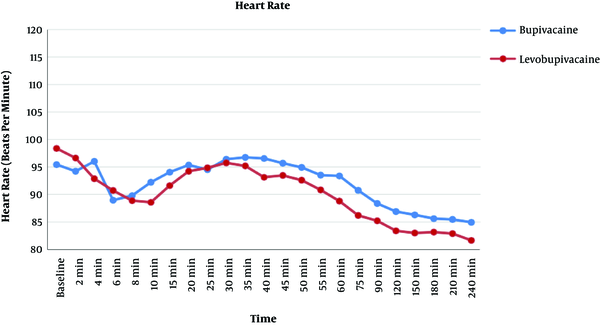 Tables 3 and 4 show the intergroup comparison of heart rate and mean arterial pressure, respectively. Figure 1. Heart rate comparison between the groups. Figure 2. Comparison of MAP between the groups. Table 5 shows the comparison of side effects between two groups. In the current study we compared the effect of isobaric levo-bupivacaine and hyperbaric bupivacaine in spinal anesthesia for lower segment caesarean section in 100 patients in northern India without any adjuvant. Block characteristics, hemodynamic parameters, and side effects were compared amongst the groups. In our study, both the groups were comparable in terms of anthropometric and demographic variables like age, weight, height, BMI, and hemoglobin values, and were statistically insignificant. In our study, sensory block level required for caesarean section was achieved adequately in both groups. The time to reach T6 sensory height, motor onset time, time to reach maximal sensory blockade, and time to reach full motor blockade were similar in both the groups and were not statistically significant (P > 0.05). Vanna et al. reported the similar block characteristics in a RCT done for endoscopic uretheral surgery (6). The 2-segment regression time in minutes was significantly less for the Levobupivacaine group (81.3 ± 18.45) as compared to Bupivacaine group (93 ± 24.05) with P = 0.007. The total duration of sensory blockade was 188.4 ± 22.71 in the Bupivacaine group and 199.8 ± 20.65 Levobupivacaine group. The difference is statistically significant (P = 0.01). The total duration of motor blockade was 201.6 ± 20.14 in the Bupivacaine group and 182.4 ± 29.59 in the Levobupivacaine group. The difference is statistically significant (P = 0.0002). Gautier et al. (7) and Gulen Guler et al. (8), during spinal anaesthesia for caesarean delivery, also reported that duration of motor block was shorter in the Levobupivacaine group than in the Bupivacaine group similar to findings in our study. Lower affinity of Levobupivacaine to A-α fibers (somatic motor fibers) than that of Bupivacaine may have resulted in a lesser motor block. Patients in the Levobupivacaine group achieved statistically higher block height than patients in the Bupivacaine group, which may be due to its isobaric nature. This finding was similar to the study of Vanna et al. (6) and Dilek Subasi et al. (9). Incidence of hypotension as side effects was seen more in the bupivacaine group as compared to the levobupivacaine group and was clinically significant P = 0.016. Other side effects like bradycardia, nausea, and vomiting were also more in the Bupivacaine group than the Levobupivacaine, however, this was statistically insignificant P > 0.05. It has been shown that the sympathetic nervous system - related side effects of levobupivacaine are less frequent than those associated with the use of bupivacaine and the mean convulsive dose for levobupivacaine is higher than that of bupivacaine (10). Hemodynamic parameters such as heart rate and Mean arterial pressure were similar in both groups and statistically insignificant except at 10 and 15 minutes after spinal, when mean arterial pressure showed a significant difference between the two groups (P < 0.05). Good hemodynamic stability, with a reduced prevalence of side effects, has been shown for intrathecal levobupivacaine in elderly patients also in studies by Cuvas et al. and Erdil et al. (11, 12). In conclusion, this study shows that spinal anaesthesia performed with both local anaesthetic drugs provides fast and effective induction of surgical anaesthesia for caesarean section. Since motor block time is shorter, sensory block time longer, better hemodynamic stability and lesser patients with hypotension, the Levobupivacaine can be a better alternative in caesarean sections. 1. Gautier P, De Kock M, Van Steenberge A, Miclot D, Fanard L, Hody JL. A double-blind comparison of 0.125% ropivacaine with sufentanil and 0.125% bupivacaine with sufentanil for epidural labor analgesia. Anesthesiology. 1999;90(3):772-8. [PubMed: 10078679]. 2. Brizzi A, Greco F, Malvasi A, Valerio A, Martino V. Comparison of sequential combined spinal-epidural anesthesia and spinal anesthesia for cesarean section. Minerva Anestesiol. 2005;71(11):701-9. [PubMed: 16278629]. 3. Horlocker TT, Wedel DJ. Density, specific gravity, and baricity of spinal anesthetic solutions at body temperature. Anesth Analg. 1993;76(5):1015-8. [PubMed: 8484500]. 4. Povey HM, Jacobsen J, Westergaard-Nielsen J. Subarachnoid analgesia with hyperbaric 0.5% bupivacaine: effect of a 60-min period of sitting. Acta Anaesthesiol Scand. 1989;33(4):295-7. [PubMed: 2655366]. 5. Fattorini F, Ricci Z, Rocco A, Romano R, Pascarella MA, Pinto G. Levobupivacaine versus racemic bupivacaine for spinal anaesthesia in orthopaedic major surgery. Minerva Anestesiol. 2006;72(7-8):637-44. [PubMed: 16865082]. 6. Vanna O, Chumsang L, Thongmee S. Levobupivacaine and bupivacaine in spinal anesthesia for transurethral endoscopic surgery. J Med Assoc Thai. 2006;89(8):1133-9. [PubMed: 17048421]. 7. Gautier P, De Kock M, Huberty L, Demir T, Izydorczic M, Vanderick B. Comparison of the effects of intrathecal ropivacaine, levobupivacaine, and bupivacaine for Caesarean section. Br J Anaesth. 2003;91(5):684-9. [PubMed: 14570791]. 8. Guler G, Cakir G, Ulgey A, Ugur F, Bicer C, Gunes I, et al. A Comparison of Spinal Anesthesia with Levobupivacaine and Hyperbaric Bupivacaine for Cesarean Sections: A Randomized Trial. Open J Anesthesiol. 2012;2(3):84-9. doi: 10.4236/ojanes.2012.23020. 9. Subasi D, Ekinci O, Kuplay Y, Muftuoglu T, Terzioglu B. Comparison of intrathecal hyperbaric bupivacaine and levobupivacaine with fentanyl for caesarean section. Med J Goztepe Train Res Hosp. 2012;27(1):22-9. doi: 10.5222/j.goztepetrh.2012.022. 10. Gristwood RW, Greaves JL. Levobupivacaine: a new safer long acting local anaesthetic agent. Expert Opin Investig Drugs. 1999;8(6):861-76. doi: 10.1517/13543784.8.6.861. [PubMed: 15992136]. 11. Cuvas O, Basar H, Yeygel A, Turkyilmaz E, Sunay MM. Spinal anesthesia for transurethral resection operations: levobupivacaine with or without fentanyl. Middle East J Anaesthesiol. 2010;20(4):547-52. [PubMed: 20394252]. 12. Erdil F, Bulut S, Demirbilek S, Gedik E, Gulhas N, Ersoy MO. The effects of intrathecal levobupivacaine and bupivacaine in the elderly. Anaesthesia. 2009;64(9):942-6. doi: 10.1111/j.1365-2044.2009.05995.x. [PubMed: 19686477].